Oh…it’s beginning to smell a lot like Christmas! As I was wandering around the stores looking for the perfect gift, I was reminded just how often ‘fragrances’ are still being used without a second thought. Candles, Air fresheners, Christmas themed car fresheners, Shampoos, Soaps, Body Butters, and the list goes on! There is no doubt that there are certain smells that remind us of the holidays and those who want us to buy, sure do capitalize on this! The malls are loaded with scents. They draw us in, trigger a memory, create a mood. But what else do these scents do? It’s concerning when you know that a ‘fragrance’ typically contains a dozen or more potentially hazardous synthetic chemicals, some of which are derived from petroleum, according to the Environmental Working Group. To protect trade secrets, makers are allowed to withhold ‘fragrance ingredients’, so consumers can’t rely on labels to know what hazards may lurk inside that new bottle of perfume or air freshener. Many of the chemicals that make up a fragrance can cause hormonal imbalances, skin issues and respiratory distress and most are not even tested. No thanks. So let’s create our own scent and an associated feeling…that actually adds to our health- by using diffusers. Diffusers break down quality essential oils into millions of micro molecules and then disperses them into the air to fill a room or work space. The particles remain in the air for several hours depending on how long the diffuser was on and how much essential oil was used. However, it only takes around 20 minutes to notice an affect! For example, a blend called ‘Easy Air’ when diffused is wonderful for easing cough symptoms by opening up the airways. On Guard will kill airborne pathogens. Balance or Lavender will calm you down. 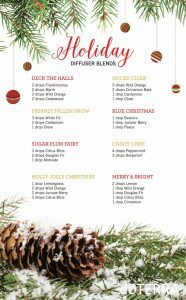 There are endless possibilities as you can see in the Holiday Diffuser Blend graphic. 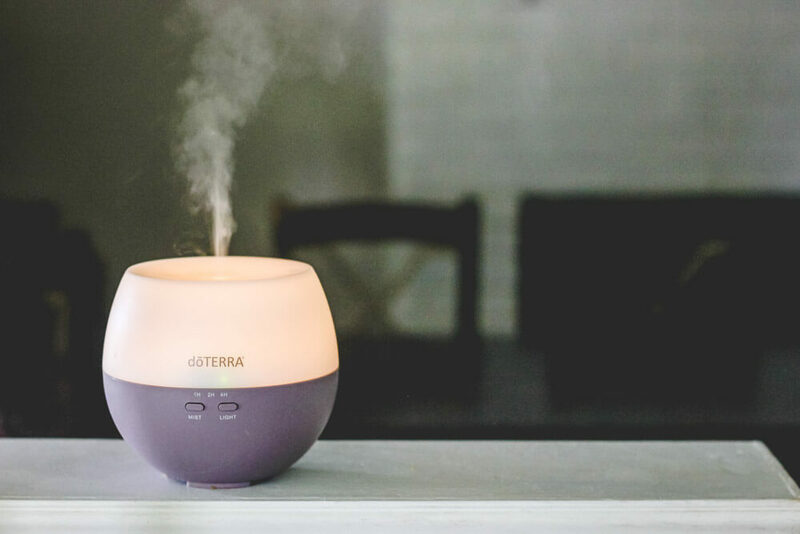 dōTERRA offers several ultrasonic / cold-air diffusers which disperse the essential oils in a micro-fine vapor that stays suspended in the air for several hours. Or simply make your own DIY Spray as I did in this video. Interested in purchasing a dōTERRA diffuser, but don’t know which one to get? Check out this Diffuser Comparison Product Information chart to help you find the perfect fit. Contact me if you would like to purchase one or if you have more questions or if you’re wondering how you can get them or any essential oil at wholesale price.